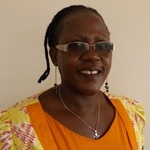 Dr Josephine Ahikire is an Associate Professor in the School of Women and Gender Studies, Makerere University and Executive Chair of the Centre for Basic Research (CBR) in Kampala. Josephine is leading ESID’s research project in Uganda on Gender and the Political Settlement. She has led a variety of research projects on gender and land, elections, women and parliamentary performance, gender and the politics of access and many other areas connected with livelihoods and social justice. Ahikire, J. and A. A. Mwiine (2015). ‘The politics of promoting gender equity in contemporary Uganda: Cases of the Domestic Violence Law and the policy on Universal Primary Education‘, ESID Working Paper No. 55. Manchester. ESID blog, 25 November 2015: ‘Why is domestic violence legislation falling short in Uganda?‘ by J. Ahikire and A. A. Mwiine. Josephine is a member of the National Governance Council for the African Peer Review Mechanism (APRM) and a board member of the Uganda National NGO Forum.